This super delicious and hearty Red Rice Caper Sweet Potato Bowl is inspired by a roasted root vegetable dish in Ottolenghi’s cookbook Plenty. Ottolenghi combines the sweetness of the root veggies with lovely zesty, fresh flavours. I am already a big fan of root vegetables, especially this time of year when it’s getting cooler. but I never knew root vegetables could taste so light and refreshing. I love the sweetness of the caramelised root vegetables and the freshness and acidity of the dressing and herbs. I have been eating a lot of roasted veggies lately at home lately, in many forms, shapes and variations, but this is my winning dish. This is a great dish coming home on a a cold, rainy evening. It’s my idea of comfort food; it’s exactly what I need to nourish myself and to chill out. Root vegetables are great in the cold season as they help you keep your body warm. This Red Rice Caper Sweet Potato Bowl is also a great meal the evening before a long endurance training or a race like a marathon. The 24 hours before a long run or a marathon you need to increase the amounts of carbs you eat. Muscle and liver glycogen (stored carbohydrates in your muscles and liver) are primary fuel sources used during endurance activity. The 24 for hours before a race you should amp up the amount of easy to digest carbohydrates in your diet. Filling up on high-starch carbs, like sweet potatoes, parsnips, turnips, pumpkin and starchy grains like rice and oats, and combining them with healthy fats like coconut, hemp oil or sesame seeds, will give you all the fuel you need during your training. This delicious Red Rice Caper Sweet Potato Bowl is a great comfort meal after a long day at work and a great way to store energy the day before a long run. If you are an endurance athlete and you want this make this meal an even more beneficial for you the evening before an important race, use coconut oil instead of olive oil to roast your veggies, use hemp oil or flax oil instead of olive oil in the dressing and top this salad off with some hemp or chia seeds. It’s all the fuel you need and it tastes really good too! Enjoy this hearty Red Rice Caper Sweet Potato Bowl! Add root vegetables, garlic, shallots and tomatoes to a large non-grease baking tray. Mix in 1/2 cup of olive oil and place thyme and rosemary sprigs on top. Roast for 50-60 minutes, mixing every 15 minutes to make sure everything gets roasted evenly. It’s ready when the vegetables are caramelised and sticky. When done, set aside to cool down. 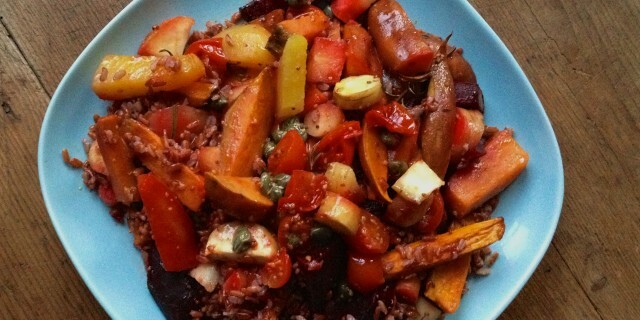 While the vegetables are roasting, cook the red rice for 40 minutes. I like to cook it al dente so it remains slighly firm and does not become all fluffy. When al dente, rinse well and set aside. In a small bowl, mix dressing ingredients and season with freshly ground black pepper and sea salt to taste. Mix all ingredients with the red rice and sprinkle the dressing on top.